Jim Anzide is an East Coast Transplant (although he’s been in LA for over 20 years) and never forgets his roots. He was born and raised in a Southern New Jersey suburb of Philadelphia called Turnersville – zip code EIEIO. He went to undergrad at James Madison University where he was a double major in Communications/Journalism and Hotel Restaurant Management. After a brief stint in the Big Apple, Jim continued on to University of Washington in Seattle where he received his MFA in Acting. Shortly after relocating in LA, Jim and a few friends founded The Ovation Award Winning – Circle X Theatre Co. where Jim was Artistic Director until just a few years ago. 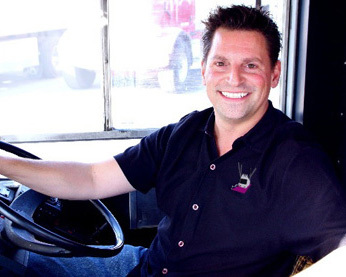 Out of all of his education, geographic upheaval and extensive background in drama, Out & About Tours – Hollywood’s 1st & Only Gay Bus Tour™ was birthed in 2009. “It has been nothing short of pure, gay joy.” Out & About Tours has several walking tours in LA and is collaborating with THE LAVENDER EFFECT® to develop interactive LGBTQ History and Culture experiences. Jim recently produced an original web series Kittens in a Cage for Stoic Entertainment and is beginning work with his newest company – Volunqueers™.